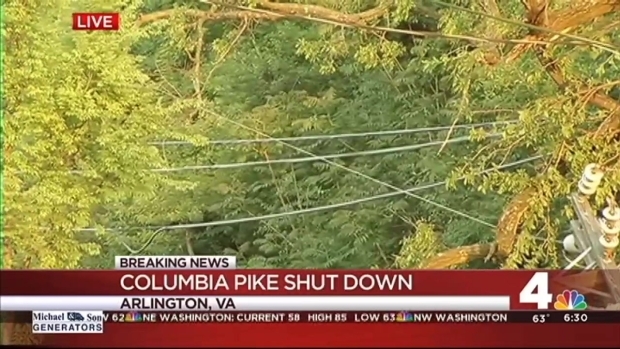 A tree brought down live wires onto Arlington's busy Columbia Pike early this morning, closing down the route for hours. Columbia Pike reopened around 1 p.m., after spending the morning closed in both directions between S. Dinwiddie and S. Jefferson streets. 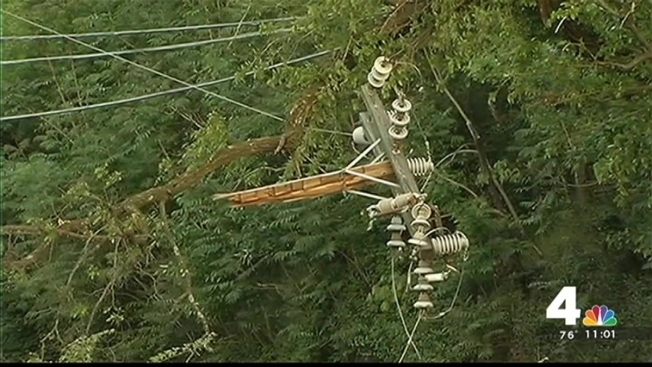 Repairs took several hours as crews dealt with a tangled mess of wires and tree limbs. "Around 3:30 or 4 a.m., I just heard a big pop," said a nearby resident. The tree snapped a utility pole, taking down power lines and a transformer. Live wires fell onto the road, especially dangerous in the dark early-morning hours. Columbia Pike Closed After Live Wires Fall Onto Rd. A busy road in Arlington County will be closed for several hours Monday as crews clear several live wires from the road. Crews reopened the roadway reopened by 1 p.m.